Being a leader and handling adversity with poise is vital to an athlete’s career. However, many athletes lack in that department due to not having the privilege of having an advisor or mentor that can provide the knowledge needed to be successful in their respective sport and also in life. Fortunately for Georgia State student-athletes, the Student-Athlete Advisory Council program equips them with the essentials to succeed in their desired career path. There are currently 30 student-athletes involved with the SAAC program. 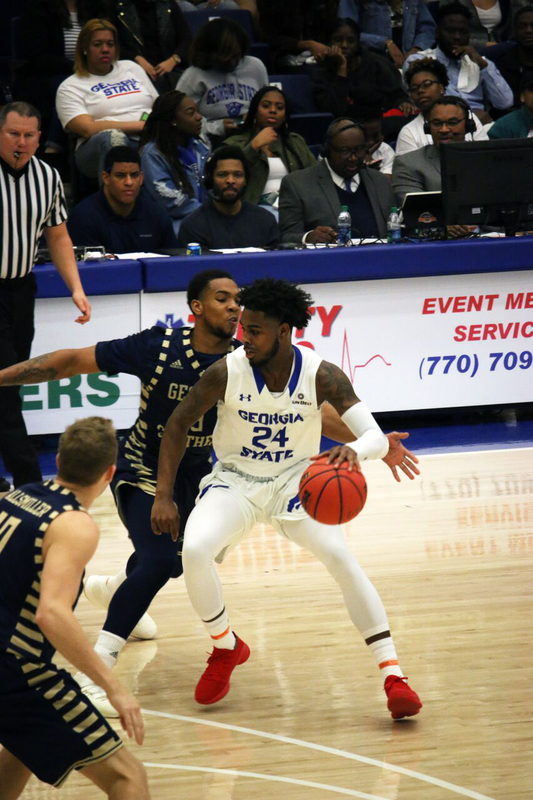 Georgia State men’s basketball combo guard, Devin Mitchell is one that has fully reaped the benefits of being a part of such a prolific organization. Mitchell was aware that SAAC was not thriving when he first became familiar with the program. This, in turn, inspired him to make a difference. “I think last year we didn’t do a very good job with [SAAC], so we kind of wanted to take a first-hand approach with it this year,” Mitchell said. Mitchell showed signs of being a leader by taking the program to new heights this year, and it has helped him thrive as a student. Not to mention, Mitchell said that being a part of SAAC is somewhat similar to how he and his teammates bond in practice. It’s no coincidence that his fellow teammate Jeff Thomas is also a member of the SAAC program. Mitchell describes the program as a tight-knit group, even going as far as to say family. SAAC not only allows the student-athletes to develop as individuals but also as teams. All of the members involved with the program are in tune with one another. As for applying the skills learned in the program to everyday life, SAAC gets assistance from athletic director Charlie Cobb. Outside of Cobb providing intel to the members involved with SAAC, Mitchell mentioned assistant athletic director, Michael Stovall, who works in the career services and life skills department. Stovall plays a crucial role in helping these student-athletes develop into intellectual students with promising futures. Not only does he have a unique way of guiding them in the right direction, but he also says that helping them cope with the challenges of being a student-athlete is vital in how successful they will be during their collegiate career. As for the life skills Stovall provides for the athletes, he says that teaching them how to transition from an adolescent to an adult is the most significant aspect of the program. “We teach them things through character ed: how to act, how to dress, how to bring themselves into adulthood,” Stovall said. As if adulting isn’t a challenge itself, Stovall also mentioned that a great deal of student-athletes are not accustomed to the challenges of being a collegiate athlete. Stovall recalls not having these same opportunities when he was in college, being that he had to face the same challenges as the student-athletes he currently assists. Nonetheless, he enjoys being able to provide knowledge to the students that will undoubtedly lead them in the right direction. Stovall takes pride in being a leader at Georgia State that can teach student-athletes the skills they need to achieve when playing sports is no longer an option.